Winners of the MFL North Hampshire Cup for the Second Year Running! 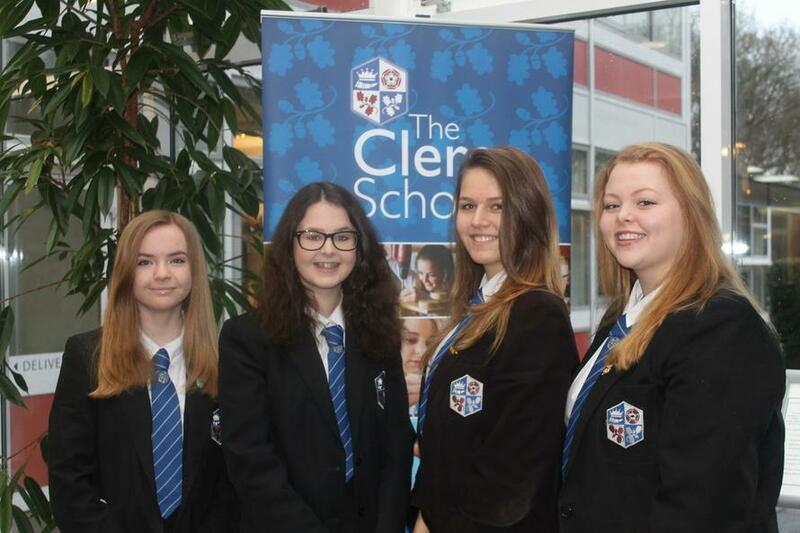 The Clere School was delighted to win the MFL Challenge Cup, as well as winning best overall team, at the Modern Foreign Languages Challenge in Basingstoke on Friday 29th January. Congratulations and well done to the French team Carys Cleghorn, Tara Smith, Anita Depukat and Ruby Joliffe, for their hard work and ultimate success. The challenge this year was to plan and market a new cafe for young people for Basingstoke Festival Place, with an emphasis on promoting the cafe to exchange students from France and Germany. They had to create an information pack about the café and convince young people to visit it. They had to decide where to locate the café, what would make it unique, give it a name and design a logo for the Festival Place website. They also had to create a radio jingle, advert and press release for the local newspapers, which they really enjoyed doing. Finally they prepared a five minute presentation to “sell” their café to the Festival Place judges and convince them to let them open their business. The Basingstoke Consortium organises a Modern Foreign Language (MFL) Challenge every year, allowing language students to demonstrate how they might use their languages in business and challenge more able linguists. The event is open to Year 10 students in all Borough secondary schools, who are tasked with completing a number of business-related tasks in French, German or Spanish.